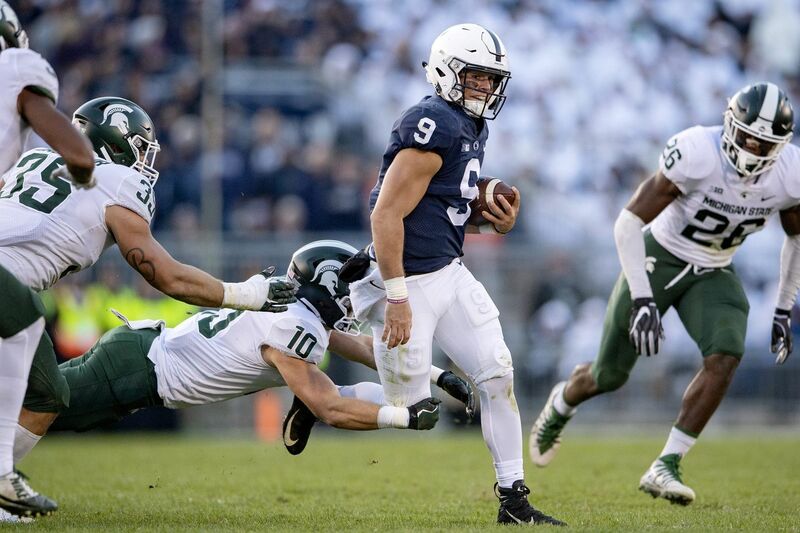 Penn State quarterback Trace McSorley, here getting taken down by Michigan State, has been running the ball more often lately. Five takeaways from Penn State's 33-28 victory Saturday at Indiana. Why put McSorley at risk? Trace McSorley, the Nittany Lions' quarterback and unquestioned leader, has the guts and heart of an entire team, but he is being put at increased risk, taking more hits while running the football. McSorley is averaging 18 rushes in the last four games, twice as many as he averaged in the first three. The fifth-year senior brushes it off, saying Saturday, "I just need to execute my job and my role and then, when the play is there to be made, make the play." Head coach James Franklin doesn't seem to mind McSorley's "shouldering a little bit more of the load right now, and that's obviously what you like to do with senior players and guys who have won as many games as he has." Nevertheless, he should not be carrying the football more than Miles Sanders, who had 15 carries Saturday, four fewer than McSorley. No one wants to see that big hit sideline the quarterback for multiple games or, worse yet, the rest of his college career. For the third consecutive game, Penn State was unable to take much time off the clock with the ball and the lead in the late stages. After running the ball with little success against Ohio State and Michigan State, the team went with the pass Saturday with miserable results: two incompletions; one completion for no gain, after which Indiana called timeout; and zero first downs. Franklin said the coaching staff has "gone back and forth with it in what we need to do" and conceded that "we didn't do a good job" with Saturday's plan. The Lions squeaked by the Hoosiers, but major improvements in efficiency need to happen with games against three ranked opponents in the next three weeks, beginning Saturday with Iowa. Shaka Toney, the Nittany Lions' redshirt sophomore defensive end from Philadelphia and Imhotep Charter, tied the program record for sacks in a game with four, all coming in the final 6 minutes. The sacks covered 29 yards in losses, and Toney also forced both a fumble (recovered by Indiana) and an intentional-grounding penalty. After arriving at Penn State at barely more than 200 pounds, Toney has developed into a 241-pound end who has worked hard to be a run stopper to add to his skills as a pass rusher. Still, the value of his ability to get to the quarterback will be immeasurable as the Lions head down the stretch. Shaka Toney tied a Penn State record with four sacks Saturday. It's almost useless to talk about dropped passes by Penn State receivers for yet another week. There were five in the game, two by Brandon Polk on one drive, and that increased the season count to 23. Some of the Lions' young receivers – redshirt freshman Cam Sullivan-Brown and true freshmen Jahan Dotson and Daniel George – saw playing time against Indiana while starters Juwan Johnson and DeAndre Thompkins were not seen for much of the second half, presumably because of injuries. Franklin said a review of the game tape and practice performance this week will determine whether changes will happen, but expect the younger guys to get a longer look. No, we're not talking about Blake Gillikin the runner, who was left hanging out to dry on an ill-conceived fake punt that lost 10 yards in the first quarter. We are talking about one of the Big Ten's best punters last season. Gillikin has been inconsistent in recent games. Saturday, some of his six punts were good, such as the 53-yarder that pushed Indiana back to the 15, from where the Hoosiers began their final touchdown drive. But he also had a 34-yarder that sailed into the end zone on the fly for a net of 14 yards. Franklin acknowledged that Gillikin is "in a little bit of a slump right now" but is confident he will work through it.